For those who are in the market for a full-size pickup truck, don’t overlook the 2013 RAM 1500 Laramie Longhorn Edition Crew Cab 4×4, as this could be one of the best trucks ever built. Yes, that’s a bold statement, but the folks at RAM have been doing work to design and build something special. The new 2013 RAM 1500 retains its ruggedly handsome appearance with all-new interior and exterior design aesthetics, improved aerodynamics and all-new segment-leading technology, and every RAM 1500 truck benefits from new content specifically designed to match each model’s unique style. RAM Truck brand designers started with the RAM grille, making it not only larger with the same overall width, but approximately one inch taller “saddled” within the new upper fascia panel for a more integrated appearance. The classic RAM crosshair horizontal and vertical grille bars are now flush at the top and bottom of the grille surround. The new front bumper design supports the “saddled” RAM grille theme with new vertically oriented fog lamps for improved light spread, distance and more lumens. Larger openings around the front tow hooks (four-wheel drive models) allow for easy access to the hooks. The 2013 RAM 1500 quad headlamp design has improved light spread, pattern consistency, distance and 30 percent more lumens. An all-new premium headlamp lighting system is a bi-functional halogen projector design with 15 amber LEDs for park/turn/position lamp and three amber LEDs for the side marker. For 2013, the RAM 1500 offers 12 different colors, including five new shades. Black Gold, Copperhead, Maximum Steel Metallic, Prairie and Western Brown are all new and available in a monotone and/or two-tone depending on the model. The new, polished stainless steel running boards have a sturdy box cross-section design. Also, the new wheel-to-wheel exclusive running board design offers aerodynamic improvements over the current version and provides customers’ improved access to the forward portion of the truck bed. A new 6-ft.-4-in. bed option is now available on Crew Cab models, giving customers the ability to combine RAM 1500’s largest available cab with the largest four-door/bed combination. All-new premium tail lamps are standard and consist of 15 red LEDs with three red LEDs for the side marker. Our test model added even more features with the Longhorn edition including lower two-toned paint and 20-inch aluminum polished wheels with gold inserts. As good as the exterior looks on the 2013 RAM 1500 Laramie Longhorn Edition Crew Cab 4×4, the interior space is just as special. For 2013, new features and technologies create opportunity for a redesigned interior with material upgrades; improved fit and finish; all-new interior themes with different colors and materials; all-new HVAC controls and new multimedia systems. 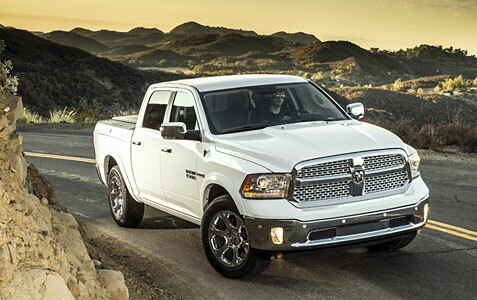 The 2013 RAM 1500 also features an exclusive 8-speed transmission with a new rotary e-shift dial design. Rear occupants can enjoy the same quality, fit and finish as the driver. With points of contact a priority, new premium materials, colors and designs are now on all four doors. Soft-touch materials enhance armrests and upper bolsters with expanded use of premium surfaces. Ram Truck has long been a supporter of the country music scene, from large to small musicians. You can see the brand’s community involvement in its partnership with the Zac Brown Band and its very own country channel on Yahoo, Ram Country. 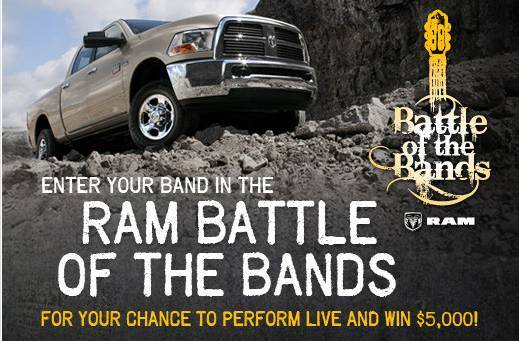 With its love for country music, Ram Trucks is holding the first ever Ram Battle of the Bands. Ram is seeking out the next upcoming country band to help jump start their journey to stardom. Country bands are encouraged to submit their band video on the Ram Truck Facebook page for a chance to perform live. Videos will be watched by country music fans and the top 10 videos with the most votes will move on to our Ram Truck panel of judges. The judges will pick the top two videos; those bands will perform live at the 2011 Rodeo Austin, where more than 25,000 fans will cheer them on. First place winner will take home a $5,000, with second place taking home a cool $2,500. Voting officially began on Jan. 3, 2011 and just for voting for your favorite band you are entered for a chance to win a country music prize pack, including an iPod and an iTunes gift card to add music to your library, along with some cool Ram Truck gear.